Southern Pink Lemonade: Baked Portobello Fries with Lemon-Garlic "Aioli"
Baked Portobello Fries with Lemon-Garlic "Aioli"
When I was around 10 years old, we were quickly running out of room in our current house so my parents began house hunting. They found a lovely house that was up for sale due to the previous owner’s pending divorce. Since this couple was in quite the hurry to get everything settled, they had the house listed at a great price. My parents could not pass up such a great deal and we ended up moving in a couple months later. Other than the great deal that they got on this house, there was another contributing factor that helped solidify my parent’s decision. My grandmother (my dad’s mom) lived next door. I know, you are probably thinking of Everybody Love’s Raymond but really, it was different-- it was great! Since my grandmother was right next door, we often shared dinners together or my mom would have my dad take her a plate. Unfortunately my Nanny has an intolerance to garlic which has resulted in my mom omitting it in just about everything she makes. It wasn’t until I went away to college that I discovered my love of garlic. Now I can’t imagine cooking without it. 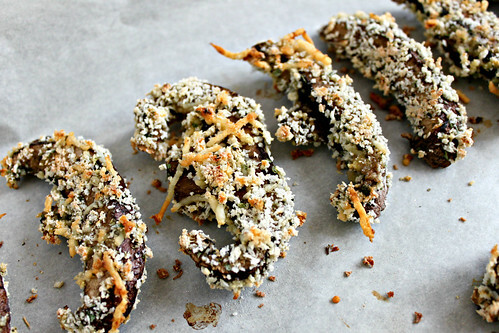 These baked portobello fries are better than anything you can order at a restaurant. Besides the fact that these are baked and not fried, the panko coating gives them a nice crunchy, airy texture and the mushrooms themselves are nice and juicy. 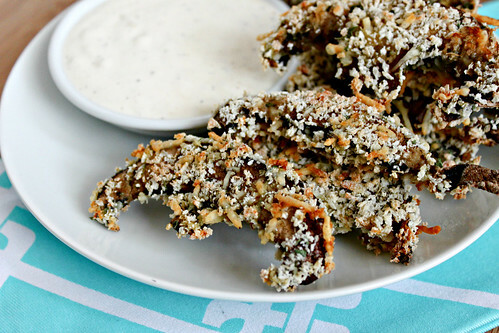 While the mushrooms are great, the lemon-garlic aioli is what really makes these portobello fries amazing. The roasted garlic flavor added to the citrusy lemon makes for a wonderful combination. Dip your portobello fries in this aioli and you will find yourself unable to stop! *I saved myself a little bit of time and bought pre-sliced portobello mushrooms since they were on sale at the grocery store. If using whole portobellos, you want to make sure you slice them 1/4-1/2 thick. Preheat oven to 425 degrees F. Line a baking pan, such as a cookie sheet, with parchment paper or a silicone baking mat. In small bowl, beat the egg. On a plate, combine the panko, flour, oregano, parsley, parmesan cheese, salt and pepper. One by one, dip the mushroom slices in the egg and then thoroughly coat each one with the panko mixture. Place the mushrooms slices on the prepared baking pan in a single layer and bake 10-15 minutes, turning the slices over half-way through to ensure even browning. Lemon-Garlic "Aioli": In a small bowl, combine the mayonnaise, lemon juice, and garlic. Season with salt and pepper to taste. Refrigerate 30 minutes prior to eating, to allow flavors to blend.